Handmade — No two shirts are exactly alike. 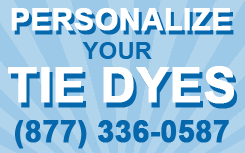 Fiber Reactive Dyes — Standard on every tie-dyed item. Permanent Colors — Colors will not fade. 100% Cotton Shirts — Premium heavyweight 100% cotton assures you the comfortable, relaxed fit you want. Dye Lots May Vary Slightly in Hue — But we take pride in our consistency. Stock Items — Stock items consist of our short sleeve shirts. If the shirts are physically in stock, they will typically ship the same day. If we have to dye any shirts, production time is usually between 2-4 business days. Custom Items — Custom items include long sleeve shirts and color combinations other than our standard 27 designs. They usually ship between 3-5 business days. Stock Items — No Minimums. Custom Items - Six (6) piece minimum per color combination.